I’m always eager to read about cooking with fresh, seasonal ingredients for healthy eating, and I want to tell you about another book that offers just that. It’s Real Food by Mike: Seasonal Wholefood Recipes for Wellbeing , and I received a review copy. Mike McEnearney operates two Sydney restaurants serving whole food cooking and believes that food is “natures’s medicine.” In this new book, each recipe comes with a note about the ingredients, their nutritional value, and how they support good health. I like those reminders about the benefits that come with eating what’s fresh from the farms each season. The recipes are organized by season and move from summer to spring. You’ll find everything from mains and sides to dessert and breakfast dishes and even preserves and drinks. There’s a Malaysian Spiced Pumpkin and Coconut Soup that sounds great for this transitional time of early fall. I also have my eye on the Mango, Avocado Lime, and Lentil Salad. The Roast Pumpkin with Chai Spice and Buttermilk is intriguing in that the pumpkin wedges are left with the skin on the outside and attached seeds on the inside to protect the flesh for a longer cooking time. The wedges take on great color from longer roasting and get topped with the buttermilk-chai dressing. The Baked Whole Cauliflower with Indian Spices, Mint, and Yogurt looks festive for a dinner party. And, the Pineapple Tarts are adorable minis made with one round slice of pineapple per tart. 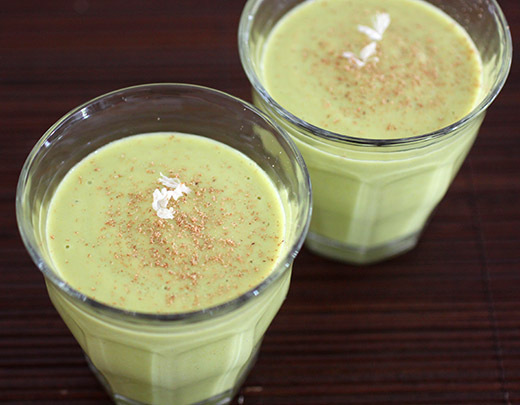 The first recipe I tried is a chilled avocado soup, but I actually thought of it more as a smoothie. It makes a great, quick, nutritious breakfast on the go. In the book, the soup is made with cashew milk, but there’s a note that any nut milk will work. I’ve recently become a fan of a locally-made almond milk called Malk that’s made simply with organic almonds, water, and a little salt and nothing else like other similar products with added stabilizers, thickeners, and flavorings. So, I went with almond milk. 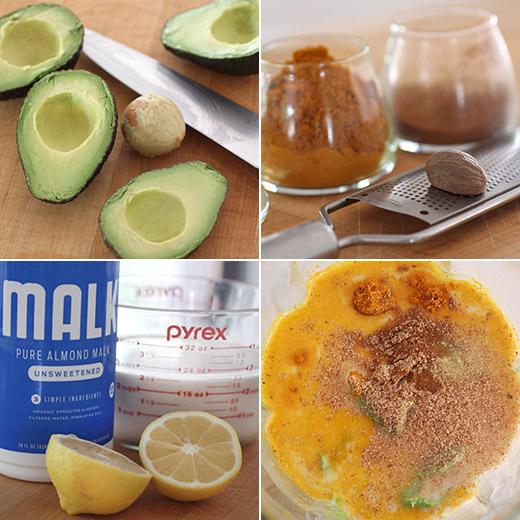 Making the soup was a quick puree in the blender of two avocados, almond milk, some salt, lemon juice, ground turmeric, ground cinnamon, freshly grated nutmeg, and a little olive oil. You’ll want to taste and adjust to your preference. I added a little extra lemon juice. Then, the mixture gets chilled until you’re ready to serve it. And, no worries about the avocado turning a darker color. 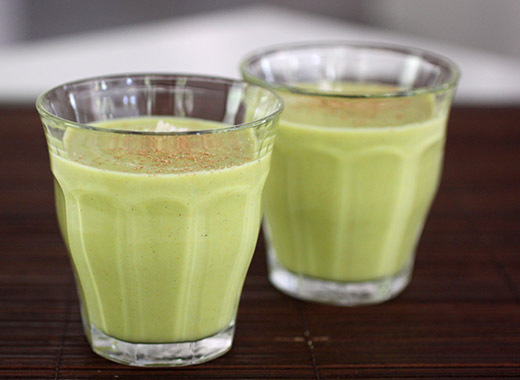 Once blended with the other ingredients, it maintains its pretty shade of green. The nutrition notes for this recipe let you know that avocado is good for lowering bad cholesterol and boosting good cholesterol, and turmeric in addition to being anti-inflammatory also has one of the highest levels of antioxidant strength of all herbs and spices. Knowing that made it even more enjoyable. And, all the other recipes in the book come with similar good news about the ingredients used. Recipe excerpted with permission from Real Food by Mike by Mike McEnearney, published by Hardie Grant Books August 2017, RRP $29.99 paperback. This refreshing soup works well for breakfast to kick start your day, or as a light lunch. There are a number of varieties of avocados available in spring and they get better towards the end of the season. There is no right type to use for this soup, as they are all as good as each other. The only prerequisite is that the avocados must be ripe with a sweet flavour. Pumpkin seed oil can be found in most health food or good food stores. If you can’t find it, try edible argan oil or a simple drizzle of very good-quality extra-virgin olive oil. This recipe will also work well with any kind of nut milk, or you can use full-cream (whole) milk. Pulse all the ingredients together in a blender or food processor and serve the soup chilled. MEDICINAL BENEFIT: HEART, SKIN Avocado is high in monounsaturated fatty acids, as well as the omega-6 polyunsaturated fatty acid linoleic acid. A diet rich in these acids can help lower LDL, otherwise known as ‘bad’ cholesterol, and increase HDL, or ‘good’ cholesterol, helpful in preventing coronary artery disease. Avocados also contain vitamins A, K, E (great for skin) and B (for muscle growth). Cashew nuts contain monounsaturated fatty acids too, plus important micronutrients and minerals like manganese, potassium, copper, iron, magnesium, zinc and selenium. Turmeric root contains curcumin, a potent compound that not only imparts a deep orange colour, but can exhibit anti-tumour, antioxidant, anti-arthritic and anti-inflammatory attributes. Turmeric’s phytonutrient profile is off the charts and its total antioxidant strength is one of the highest of all the herbs and spices. The Austin Bakes group did it again. After coming together in 2011 for a hugely successful fundraising bake sale following the earthquake and tsunami in Japan, additional sales have been held over the years to raise funds for recovery efforts from natural disasters and other crises. Immediately after Hurricane Harvey, this most recent bake sale was planned. 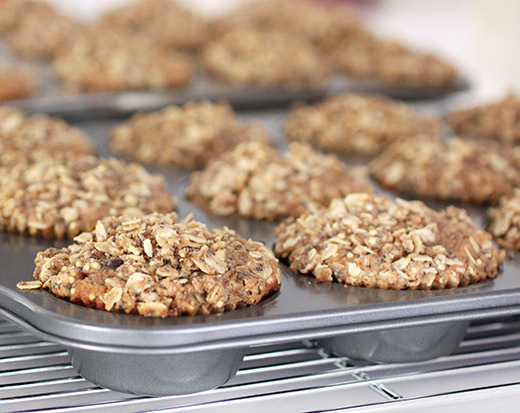 Local food bloggers, food enthusiasts, and food businesses all volunteer their time and donate baked goods for multiple locations that are set up around Austin. And, once again, the local community was incredibly supportive of the event. The goal of raising $20,000 was achieved, and the online giving page is still active for additional donations. I love an opportunity to bake for a good cause, and right away I started pulling cookbooks off the shelves to decide what to make this time. I often reach for the Huckleberry book for baking, and the Muffins chapter is one I want to bake through page by page. For the bake sale, I made both the Chocolate Chunk Muffins and the Apple Cinnamon Crumble Muffins. 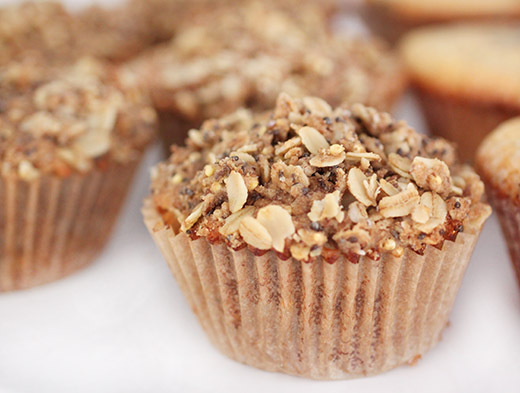 I really liked both recipes, but I want to tell you more about the Apple Cinnamon Crumble Muffins since they’re so great for fall. Perfectly timed, I had receivced local apples from my CSA to use here. The apples were peeled and grated, and I waited to do that until just before folding into the batter to prevent the apple from turning brown. First, the crumble mixture was made with oats, whole wheat flour, softened butter, brown sugar, honey, millet, chia seeds, ground flax seeds, and a little salt. The butter was worked into the other ingredients by hand until well mixed and crumbly. Then, it was refrigerated. 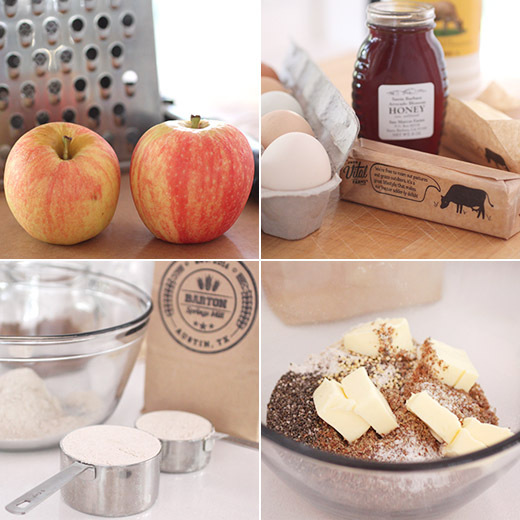 For the muffin batter, whole wheat flour, almond flour, wheat germ, millet, chia seeds, ground flax seeds, oats, cinnamon, baking powder, baking soda, brown sugar, granulated sugar, and salt were whisked together. In a separate bowl, melted butter, honey, buttermilk, oil, an egg, and vanilla were combined. The wet ingredients were added to the dry, and the batter was stirred to combine. Last, the grated apple was folded into the batter. After the muffins cups were filled, the chilled crumble mixture was sprinkled on top of each, and the muffins were baked for about 20 minutes. This is a muffin that’s packed with lots of good-for-you stuff, but it’s not at all a boring health-food kind of muffin. Even with the wholegrains and seeds, the interior has a very tender crumb. And, a crumble topping and I are always friends. I was happy to bring these to the bake sale, but now I want to bake another batch all for myself. Do you believe that true beauty comes from within? That idea is taken very literally in a new cookbook that offers nutrient dense dishes that help balance gut health and thereby assist with keeping your complexion at its best. The Beauty Chef: Delicious Food for Radiant Skin, Gut Health and Wellbeing by Carla Oates, of which I received a review copy, is a guide to eating for a medicinal effect. Oates writes: “the food we eat provides the ecosystem that interacts with our immune system to maintain our health and skin and overall wellbeing.” Whether you choose to eat certain foods specifically for their positive effect on skin conditions or you just want to try these recipes packed with nutrition powerhouses, there are a lot of great options here. First, there’s a list of nutrients with an explanation of why each one is good for you along with the foods in which it’s found. Then, throughout the recipes, the head note information will have some reminders about those nutrients and which ones are in the dish. The chapters cover Breakfast, Lunch, Snacks, Dinner, Sides, Desserts, Baking, Drinks, and Basics. I became hooked quickly after seeing the variety grains and fresh vegetables used, the abundance of fermented pickles, and the use of less-refined sweeteners like honey and maple syrup. There’s an Autumn Spice Smoothie Bowl made with oats, banana, and almond butter and topped with poached pears that I can’t wait to have for breakfast. And, I marked almost every page in the Lunch chapter with dishes like Warm Cauliflower Couscous Salad with Roasted Roots, Hazelnuts, and Crispy Spiced Chickpeas; Raw Rainbow Salad with Soft-boiled Egg and Creamy Miso Dressing; Buckwheat Noodles with Miso-Roasted Pumpkin, Caramelized Onion, and Umeboshi Plum Salad; and Lunch Wraps with Poached Chicken and Celeriac and Roasted Almond Remoulade on homemade Millet and Linseed and Spinach Wraps. If that all sounds a little too virtuous, bear in mind there are also recipes for oven-fried chicken, bbq ribs, and creme brulee. But since I’ve been going meatless and dairyless a little more often lately, I decided to start with a snack of Almond, Olive, and Rosemary Crackers with Roasted Butternut Squash, Chile, and Tahini Dip. In the book, the crackers have “Cheesy” in the title, but I don’t think that’s even necessary as a selling point. The cheesy flavor here comes from nutritional yeast. These are gluten-free crackers made with almond meal mixed with the yeast flakes, chopped Kalamata olives, fresh rosemary, and salt and pepper. An egg white and some coconut oil hold the dough together. The dough was rolled out between pieces of parchment paper. Then, it was scored and left on the bottom piece of parchment for baking. There’s a nice tip for baking the crackers: as the outside crackers become browned, they can be cut along the scored lines and removed. Then, the pan can go back into the oven to brown the rest of the crackers. 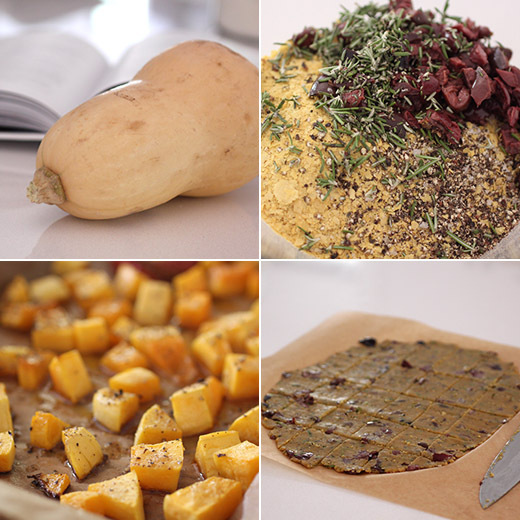 The dip was a simple puree of roasted butternut squash, a roasted tomato, and roasted garlic and chile. Tahini and lemon juice were added to the food processor while pureeing. 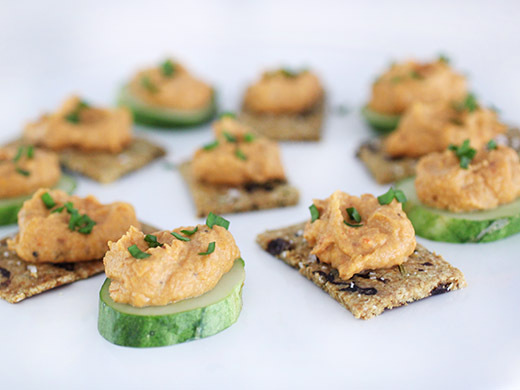 The crackers have great, savory flavor with the olives and rosemary and the underlying umami from the yeast flakes. If they lose their crispness after sitting for a bit, they can be popped into a warm oven to bring back their crunchy state. The butternut squash dip paired well with them. And, sliced cucumbers made good vehicles for it as well. There are several more things I’m eager to try from this book and it will be a nice bonus if I happen to achieve a healthy glow in the process. Recipes reprinted with publisher's permission from The Beauty Chef: Delicious Food for Radiant Skin, Gut Health and Wellbeing . The combination of olive, rosemary and cheese is a delight. However, in this dish I have used yeast flakes instead of cheese, which are rich in B vitamins and a great substitute for the flavour of cheese. Preheat the oven to 150ºC (300ºF). Combine the almond meal, savoury yeast flakes, olives, rosemary, salt and pepper in a medium bowl. Add the egg white and oil and mix well to combine. Roll the almond mixture out between two pieces of baking paper, to make a 24 cm (9 1/2 in) square, approximately 2 mm (1⁄16 in) thick. Discard the top sheet of paper. Using a large knife, score the almond mixture to make 24 crackers. Press the ends of a fork into the centre of each cracker to mark. Transfer the crackers on the sheet of baking paper onto a large baking tray (cookie sheet). Sprinkle with additional salt. Bake for 10–15 minutes, until light golden. Remove from the oven and cut through the scored marks. Separate into individual crackers. Remove the outer crackers that are crisp and golden and set onto a rack to cool. Cook the remaining crackers for a further 5 minutes, or until golden but not browned. Transfer onto the rack and leave to cool completely. Serve with dips, spreads, or as part of a meal. A flavour-packed dip, starring pumpkin (winter squash), which is a great source of skin-rejuvenating vitamin A. And did you know that when you consume foods high in vitamin E – such as tahini (made from sesame seeds) – around seven days later vitamin E is secreted through your sebum to provide a protective layer? Place the pumpkin and tomato on a baking tray (baking sheet). Drizzle with olive oil and roast for 30 minutes. Turn the pumpkin, add the garlic and chile and roast for a further 15 minutes, or until the garlic and chile are soft and the pumpkin is tender and caramelised. Set aside to cool slightly. Squeeze the garlic out of its skin. Peel the tomato and chillies. Scrape the seeds out of the chiles and discard. Place the pumpkin, tomato, 2 tablespoons extra-virgin olive oil, garlic and chile in a high-speed food processor. Add the remaining ingredients and blend until smooth. Season with salt. 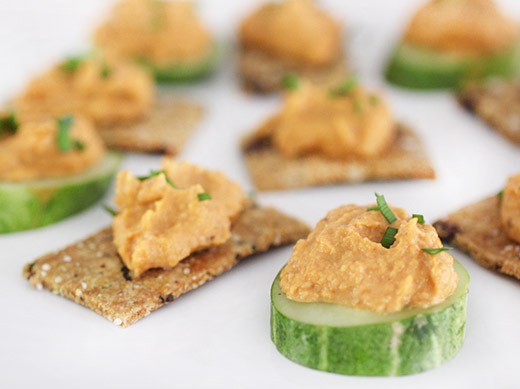 Serve with crudites, crackers or as part of a meal.